The Orioles have discussed free agent first baseman Casey Kotchman, according to Roch Kubatko of MASNsports.com. The soon-to-be 29-year-old hit .306/.378/.422 for the Rays in 563 plate appearances last season. Kotchman has been linked to the Indians and Rays this offseason though Tampa Bay might not be in the mix any longer after re-signing Carlos Pena. By signing Kotchman, the O's could make Chris Davis the primary DH and use Wilson Betemit as more of a utility player and part-time DH. Twins GM Terry Ryan told MLB.com's Rhett Bollinger that he's not ruling out the possibility of adding some more pitching (Twitter link). "I don't think you should ever say you're set to go," said Ryan. A top Royals official told Bob Dutton of The Kansas City Star that he'd "be really surprised" if the team signs or trades for another starting pitcher before Spring Training (Twitter link). Dutton says the team wants to get a look at its in-house options. Royals GM Dayton Moore confirmed Dutton's report, telling Jon Paul Morosi of FOX Sports: “We could have probably jumped in there on some pitchers who were traded, but we need another year to find out what we have here with guys like Chris Dwyer, Jake Odorizzi and [Mike] Montgomery … We may be more receptive to a deal like that next year"
The Indians remain interested in Carlos Pena and Casey Kotchman, reports Jon Heyman of CBSSports.com (on Twitter). We've heard about their interest in both players throughout the offseason. The Indians signed Jeremy Accardo to a minor league contract earlier today, and Tom Withers of The AP has the details (on Twitter). Accardo will make $825K if he's on the 40-man roster, with another $300K in incentives. Phil Mackey of 1500 ESPN provides the details of Joel Zumaya's contract with the Twins (on Twitter). The right-hander is guaranteed $400K of his $850K base salary, and he'll get all of it if he makes the team to start the season. Heyman could see the Phillies checking in on Francisco Cordero, but suggests Brad Lidge and Kerry Wood are more likely targets for Philadelphia. Casey Kotchman and Carlos Pena seem to be the most likely offensive options for the Indians and both are also in play for the Rays, Heyman tweets. Six or more teams are looking for infield depth, so Heyman examines the market for free agent infielders such as Eric Chavez, Aaron Miles and Jack Wilson. The Reds are looking for an infielder and an outfielder, Heyman tweets. He suggests Ryan Ludwick, who played under GM Walt Jocketty in St. Louis, would be a “perfect fit” in Cincinnati, where the Reds would like to add depth in left field. The Reds have some interest in Ludwick, Rick Ankiel and Cody Ross. The Red Sox remain interested in Joe Saunders, Hiroki Kuroda and Roy Oswalt, Heyman tweets. Free agent first baseman Casey Kotchman is on the Indians' radar, tweets SI's Jon Heyman. Heyman says the Tribe is looking at every everyday first baseman aside from Prince Fielder and Albert Pujols. Earlier today, Jon Paul Morosi of FOX Sports tweeted that the Indians are "focused on either a first baseman or complementary outfielder." Kotchman was one of the year's best minor league signings, as he hit .306/.378/.422 for the Rays in 563 plate appearances. He ranked 36th on my top 50 free agents list. Friedman stuck to only discussing the Rays and declined to comment on his connection to the Astros' open general manager's job. The Astros have permission to speak to Friedman and he is thought to be their top candidate. The Rays' are looking for help at DH and first base, so free agents Casey Kotchman and Johnny Damon are "very much in the discussion" to be brought back, Friedman said. The club isn't looking to deal one of its eight starting pitchers but if one was dealt, Friedman says it would be for Major League players that could contribute right away. Topkin writes that there has "been heavy interest" in Tampa Bay's pitching from other teams. Reid Brignac, Elliot Johnson and Sean Rodriguez are expected to handle shortstop, so Tampa Bay isn't looking to bring in another player for the position. Friedman is open to adding catching depth but isn't sure it will be available. The catching job will be split between the newly-signed Jose Molina and either Robinson Chirinos or Jose Lobaton. Since the Rays want to add to their offense, it doesn't seem likely that B.J. Upton will be traded this winter. MLB.com's Bill Ladson cites three different sources in reporting that Wally Backman, who currently manages in the Mets minor league system, was never offered a position with the Nationals' Major League club. Backman told Ed Randall of New York's WFAN radio that he will remain in the organization rather than accepting a position on another team's Major League staff, according to MetsBlog. Backman interviewed for the Mets' managerial vacancy before it went to Terry Collins last year. The Red Sox are not expected to interview former Diamondbacks skipper A.J. Hinch for their managerial vacancy, a source familiar with the situation tells Alex Speier of WEEI.com. Hinch is currently vice president of pro scouting for the Padres. 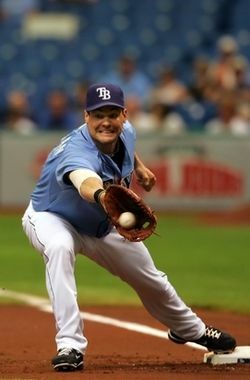 The Rays are unlikely to make quick decisions on whether to re-sign free agents Johnny Damon and first baseman Casey Kotchman, writes Marc Topkin of the St. Petersburg Times. Tampa will look to improve its offense, according to Topkin, but that won't be easy without detracting from its deep well of pitching talent, which it won't want to do. Andrew Friedman will likely do most of his roster shuffling via trade, writes Topkin. As their core position players are getting older and dealing with injuries, the Phillies' window of opportunity may be closing, opines Bob Brookover of the Philadelphia Inquirer. One talent evaluator told Brookover that the Phillies should let Jimmy Rollins walk in free agency. "It might be time to find out about a guy like Freddy Galvis," the scout said. "I saw him this year and he really is improving. I don't know if he's ready to be an everyday player in the big leagues, but I just think they need to get younger." Former Yankees pitching prospect Brandon Weeden, now 28, has resurfaced as the starting quarterback of the Oklahoma State Cowboys, writes Tom Spousta of the New York Times (cap tip to Mike Axisa of River Ave. Blues). Weeden was a second-round pick of the Yanks in 2002 (a compensatory selection for Tino Martinez signing with the Cardinals), but he washed out of baseball by 2007 due to injuries and ineffectiveness. The Rays signed a middle of the order hitter last offseason, but it wasn't Manny Ramirez. After just five games with Tampa, Manny abruptly retired rather than face a second suspension for testing positive for a banned substance. The Rays filled Ramirez's roster spot by promoting Casey Kotchman from Triple-A, and five months later, he's the middle of the order bat the team thought it was getting in Manny. Kotchman, still just 28, has stepped in and hit .312/.380/.429 in 487 plate appearances since being promoted. He isn't hitting for much power (just eight homers), but he's drawing walks (42) and putting the ball in play (55) while providing his usual strong defense. After years of struggling against left-handers, Kotchman is hitting a respectable .300/.336/.367 against southpaws this season. There are reasons to believe that the improved performance is unsustainable, however. Kotchman's batting average on balls in play (.341) is the highest of his career (by far) even though there's been no significant change in his batted ball profile. More than half of the balls he puts in play are hit on the ground, just a quarter are fly balls, and fewer than one in five is a line drive. It could work, but it hasn't for him in the past. Low power first baseman usually aren't in high demand on the free agent market, especially ones with the proverbial "one good year." That said, Kotchman could be a nice, budget friendly alternative to stopgap first basemen like Derrek Lee, Lyle Overbay, and Carlos Pena. The Diamondbacks, Pirates, and Dodgers could all be looking for help at first this winter, and of course re-signing with the Rays is always a possibility as well. Derek Jeter, Ryan Howard and Derrek Lee aren’t the only former CAA clients agent Casey Close will continue to represent now that he’s at Excel Sports Management. Close told MLBTR that he still represents Tyler Clippard, Michael Cuddyer, Alex Gordon, Jerry Hairston Jr., Scott Hairston, Casey Kotchman, Ben Sheets, Marcus Thames and Jamey Wright. Close left CAA Sports in February and recently joined the New York-based agency Excel Sports Management. For the latest on all agencies and players, check out MLBTR’s Agency Database. The Rays signed Casey Kotchman to a minor league deal and invited him to Spring Training, according to Marc Topkin of the St. Petersburg Times. The deal could pay Kotchman $750K, according to Jon Heyman of SI.com (on Twitter). Kotchman, 28 next month, provides insurance for Dan Johnson, another left-handed hitting first baseman. Kotchman hit .217/.280/.336 in 457 plate appearances for the Mariners last year, adding nine homers and 20 doubles. He hit as many as 37 doubles for the 2007 Angels, but his production has dropped off since. The former first rounder has a .736 OPS against right-handed pitching and a .656 OPS against left-handed pitching in his career. The Indians had interest in Kotchman as recently as yesterday.